BOO! Did I get you? Naw, didn’t figure but the witching hour is upon us and you’ll need to be prepared! The May Arts DT has been sharing projects all week long to get you ready. 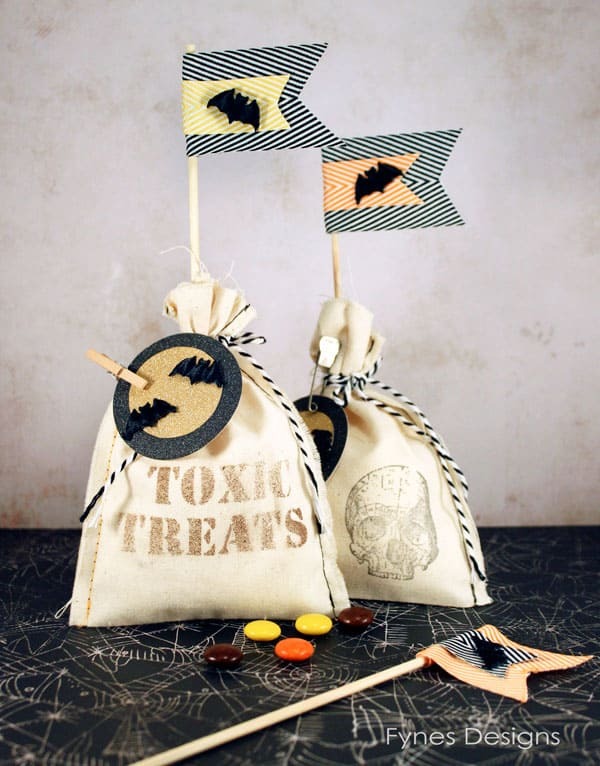 Today I want to share a great idea for a Halloween Treat Bag. 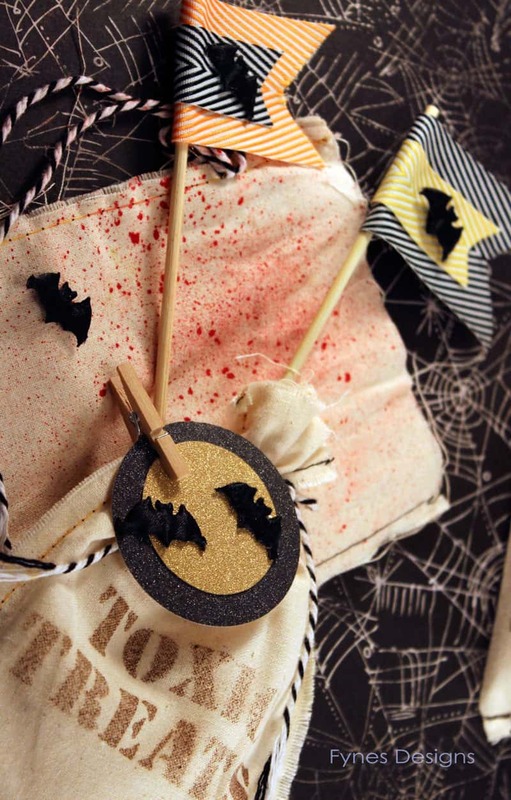 I sewed these simple muslin bags and added a Halloween stamp. Muslin is really cheap (like $2 a meter) and the raw edges just add to the look. Don’t the May Arts bats flying in front of the DCWV glimmer paper full moon make them so festive? A simple BBQ skewer, adorned with a chevron twill flag adds a little extra cuteness to a simple treat bag. Don’t have any halloween stamps? Just cut a text mask with your electronic cutter and mist words onto the muslin. No cutter? Give a squirt of red mist to get the blood splatter look; thats sure to make them creeptastic! Will you be making any frightening trick or treats this year? Toxic treat bag too eerie? Check out this untraditional Halloween Treat bag. Need a great decor idea? slide on over to Fynes Pharmacy and make your own DIY Halloween Apothecary Jars. Be sure to leave a comment right here, and hop along to win your choice of 3 spools of ribbon to create you own haunting projects! Very cute–I like how you stamped on the bags. 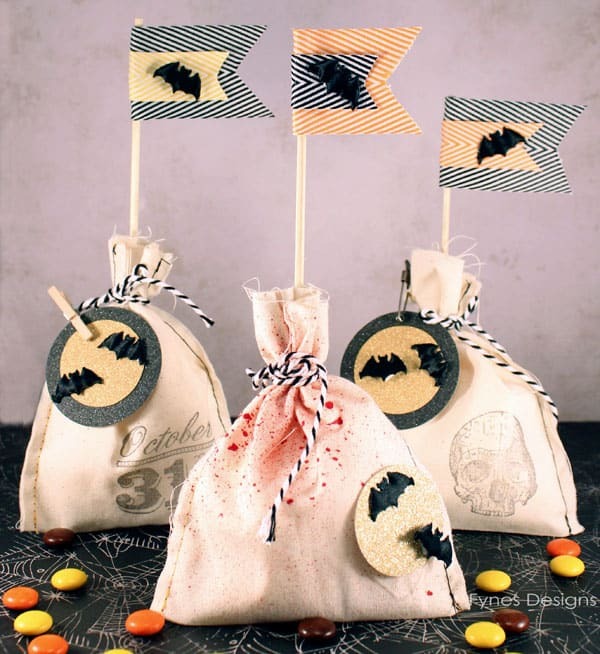 SUPER CUTE treats – LOVE your little bats and delightful chevron flags!!! Such fun and festive treat bags! Great work! These are so Spooktacular !! TFS . 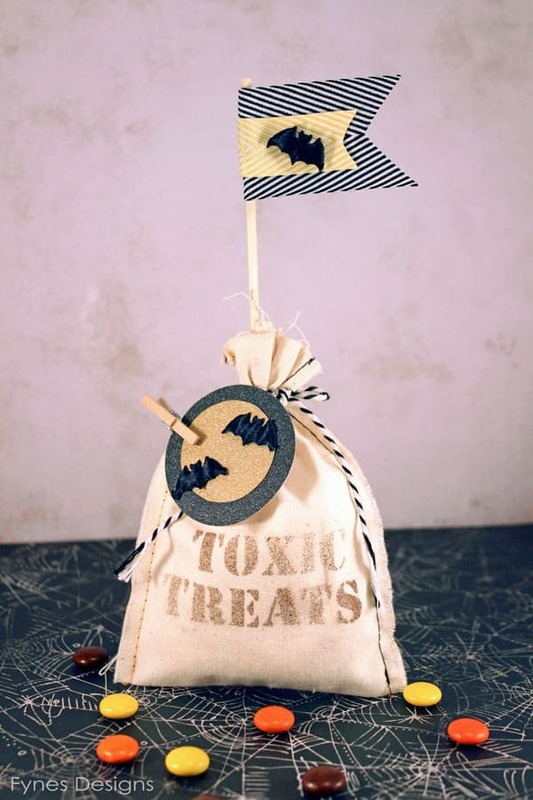 Cute ideas for trick or treat bags. Love your little chevron flags. Thanks for sharing your ideas with us. I love these. What a great idea. Your details are wonderful. So spooky. Love it. Cute bags to give to trick or treaters. Will have to try these for some of the special kids in the neighborhood. I OWN one of these bags! I LOVE IT! Super cute treat bags with my favorite ribbon!! What a cool Halloween treat bag! Thanks for linking up with us at the #HomeMattersParty!